Synopsis (from the publisher): Molly Murphy, now Molly Sullivan, and her husband Daniel, a captain in the New York Police department, have been invited to spend their honeymoon on the Newport, RI, estate of Alderman Brian Hannan in the spring of 1904. Molly doesn't entirely trust the offer. Hannan — an ambitious man — has his eye on a senate seat and intentions of taking Tammany Hall to get it. 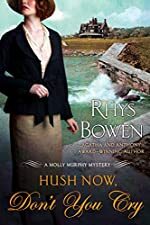 When Hannan is found dead at the base of the cliffs that overlook the Atlantic, Molly's suspicions are quickly justified, and as much as she wants to keep her promise to Daniel that she won't do any more sleuthing now, there isn't much she can do once the chase is on.